A flood control project was proposed for construction to protect the city and surrounding area. 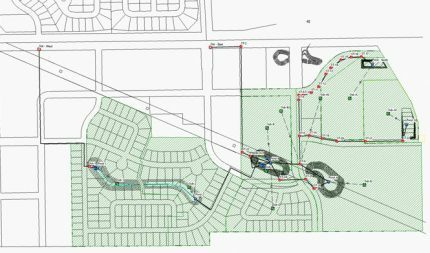 This project required providing new residential lots for homeowners impacted by the construction, modification to the sewer and water system and provision for storm water management internal to the levee system. It also involved several challenges from a golf course standpoint: incorporating nine new holes to replace nine of 18 existing holes, relocating the clubhouse and other associated facilities to a new location amongst the new nine golf holes, maintaining continuity and connectivity between the new and existing holes, incorporating a levee into the golf course, and determining an interim golf course layout for play of golf while portions of the existing course are renovated to allow for levee construction in the golf area. The schedule of construction for this project was a key component due to the requirement that the 18 holes be open through the entirety of the construction project. The intent is to provide a “grow in” season to allow the grass to establish prior to introducing golf activity on the new nine holes and other areas that are renovated due to levee construction. Moore Engineering worked closely with the city, golf club, golf course architect, and the development planner to maintain the existing quality of living while melding together the need for residential housing, municipal infrastructure, a high-quality golf experience, and storm water management to produce a development and course that is highly desirable and met the primary objectives of the local stakeholders. Planning and design involved multiple planning sessions, generation of several alternate layouts, design and coordination of meetings, and public presentations to gather input and feedback and work toward the ultimate finished product. The design of the ponds was a key component, integral to the different aspects of the project. 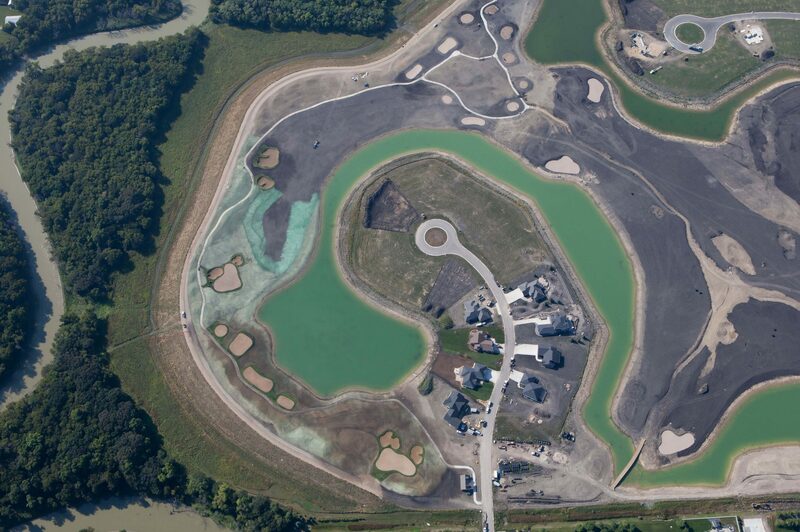 The ponds function in a number of ways: as borrow locations for material needed as fill in the golf course and on the residential lots, as a water feature along and through several golf holes, as a storage location for the water used for golf course irrigation, as an amenity to the residential lots, and as a retention area for storm water in the development. 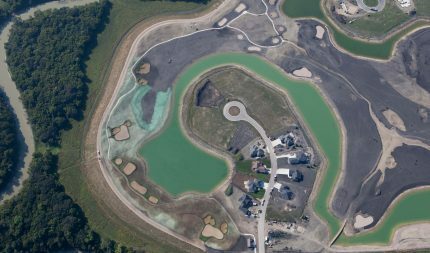 The construction of the projects involved a strategic, coordinated effort between the municipal infrastructure, levee construction and golf course amenities. Construction was split into multiple contracts and phases so critical pieces of the project could be constructed in an orderly, timely fashion. This intentional phasing of construction allowed multiple contractors the opportunity to work on their specialized aspect of the project at specific times in order to maintain the overall project schedule. Currently, the project is on schedule. Municipal infrastructure, residential lots and storm water ponds have been constructed. The golf course drainage, irrigation, and fine grading are under construction.